Dragonfire Texas Blues Strat pickups offer the opportunity to get the Hot Texas tone you’ve been yearning for to amp up your playing. Overwound with unique blue wire for some of the hottest single coil performance out there, these will definitely bring the heat! 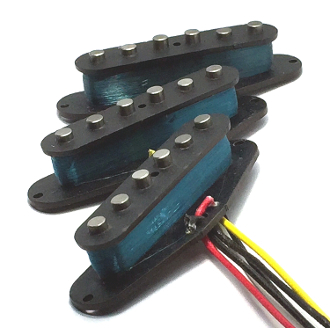 Great for Blues, Rock, Country & more, these feature big, in-your-face play without the mud associated with other hot single coil Strat pickups. For great clarity, nice mid-range, and beautiful low-end wrapped up in a hot, Alnico presentation the Texas Blues are the way to go. The AlNiCo 5 (AV) magnets in these pickups are highly charismatic and provide warm, smooth tone for a less harsh result. Alnico magnets can help give you a well-rounded and dynamic outcome while still allowing for plenty of attack and coherence. These are dedicated position pickups for performance enhancement and differentiation. Each pickup is wound specifically for a position so these pickups are not position interchangeable. The Middle position pickup is Reverse-Wound and Reverse-Polarity (RWRP) to ensure the best possible set execution and collaboration. RWRP offers hum-cancelling in Positions 2 & 4. Beveled vintage style slug polepieces with a gentle edge slope add visual depth and subtle detail. Staggered poles allow for balanced output as well as maximum string response and set-up options. These are 2-wire pickups that come with a colored hot and a black ground wire for easy installation. 500K pots and 0.047 tone caps (available separately) are recommended for use with these pickups. We offer your choice of a single (bridge, middle or neck) pickup or a matched SSS set.